La Pedregoza is a 2,650 hectare (6,545 acre) tree plantation and natural reserve in the Colombian department (state or province) of Vichada, in the Orinoco River basin. The plantation uses sustainable practices and natural silviculture, seeking whenever possible to emulate the climax vegetation of the region, using organic fertilizers and biological controls. The focus of the plantation is to produce forest products that do not contaminate the soil or water systems, while actively practising conservation and biodiversity preservation. La Pedregoza is making as many natural fertilizers as possible to support the trees we cultivate, which include Acacia mangium, Eucalyptus pellita, Pinus caribaea and over 40 species of native trees, such as Acosmium nitens, Copaifera pubiflora, Simarouba amara and Vochysia lehmanii. Quality manure is a very important fertilizer, which is why we maintain a stable with Zebu cattle. The nutritional content of the feed our cows eat has a direct bearing on the quality of their manure, so we are looking at ways to enhance their diet during the dry season (January to April), when native grasses dry up and are little better than cellulose. Silage can be a helpful solution during the dry season; this article explains the process we are employing at our plantation. For our purposes, silage is made from fresh grass or other green fodder that is chopped, mixed with molasses, compacted and then stored and fermented under airtight conditions, to be used as animal feed when climatic conditions are appropriate. Silage is important because it retains up to 80% of the nutritional value of the fresh grass or fodder; by contrast, hay or dried fodder will lose up to 80% of its nutritional value. Silage is a better feed for cattle than dried fodder, and also results in better quality manure that can be used to prepare compost or other fertilizers. We plant a variety of grasses at La Pedregoza. 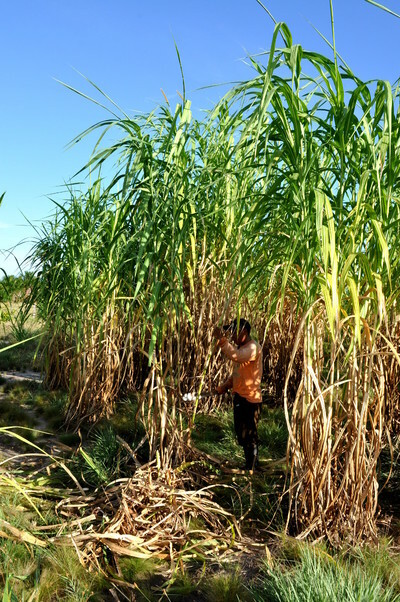 The most productive one is African elephant grass (Pennisetum purpureum), which can grow to be 4 meters tall, spreads well in the pasture, and produces up to 40 metric tons of biomass per hectare per year. 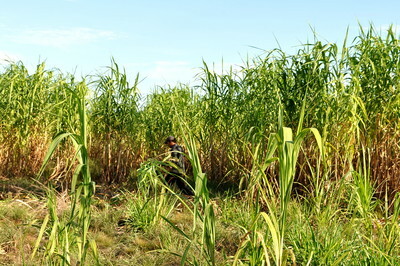 This high rate of biomass production means that elephant grass is not just a useful animal feed, but could also be ploughed into poor soils to enhance the soil’s organic matter, carbon and nitrogen content. While it produces and grows from seed, elephant grass is more efficiently propagated using stem cuttings when the plant has matured. The grass is tolerant of poor soils and low rainfall, which is advantageous in some tropical locations. Brachiaria pasture at La Pedregoza. We cultivate two other grasses in our silvopasture project, both of which have reasonable protein contents and can be used for silage. Brachiaria decumbens tastes bitter, while Brachiaria humidicola is sweeter and more nutritious, especially when cultivated with other legume plants. Having a variety of grasses and fodders enhances the cows’ menu and improves the quality of the manure. 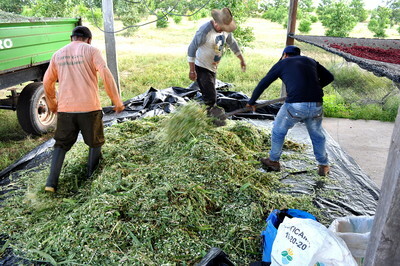 Nevertheless, this article focuses on making silage with elephant grass. 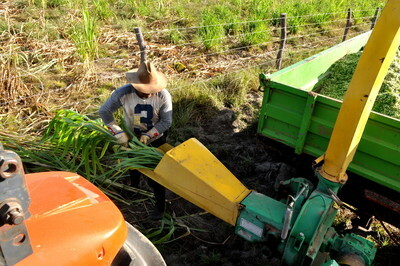 We harvest using machetes, much the way sugar cane is harvested. 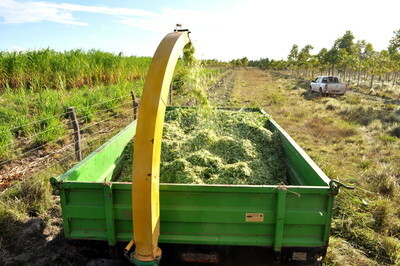 The bundles of cut elephant grass are carried to and fed into the chopper, which is powered off the tractor’s PTO, and which casts the chopped grass into a wagon. One full wagon holds about 1,200 kg of chopped material, which is a reasonable amount for one day’s silage making. It represents two hours of harvesting and chopping by two to three farm hands. If we harvested and chopped any more than this at one time, we might end up with drier and less nutritious material even one day later. 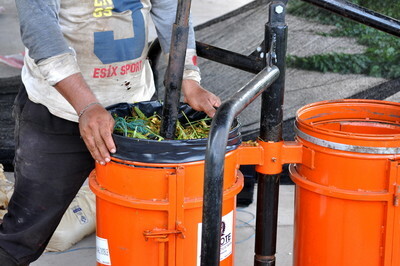 Our next steps are to mix the chopped grass with molasses, then stuff the material into bags and seal them. 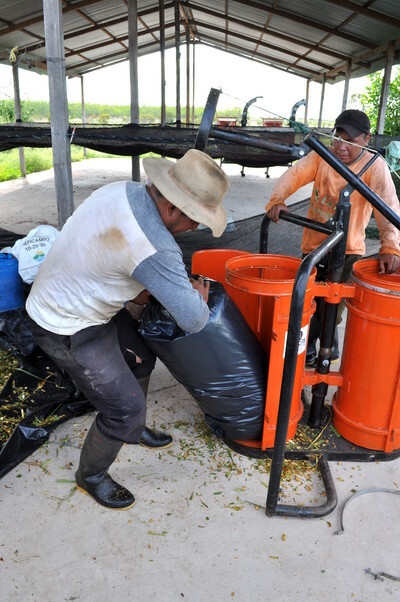 For packing the grass, we use a two-barrel manual silage press, which allows for a fast work flow. Each barrel accommodates a heavy gauge plastic bag that can take 40 kg of chopped grass. Our daily target is 30 bags of silage weighing around 40 kg each. The 40 kg bags are easy to carry and transport, and they stack well. We store them in a shed. This part of the process takes three farm hands four hours to complete. Silage must be mixed evenly to ensure good fermentation. We add 10 kg of molasses to every 200 kg of chopped grass; we also add about 1 kg of cattle salt. We use shovels and rubber boots to mix until the molasses is well distributed throughout the grass. Next, we fill the bags. We compress the grass mixture in each bag to remove as much oxygen as possible. We start with 10 kg of mix in the bag and compress it, before adding more material and compressing again. Silage must be fermented anaerobically (without air). If air is left in the bag, the silage will spoil and will smell horrible, at which point it is only useful as compost. The secret of good silage is to remove as much air as possible before sealing the bags. To do so we fill the bags in 2 or 3 stages, applying compression with a silage press at each stage, as air can get trapped if the bag is filled all at once. Within days of making silage, the storage area should have a nice aroma, similar to that produced when making beer or wine. Silage bags stored in shed. 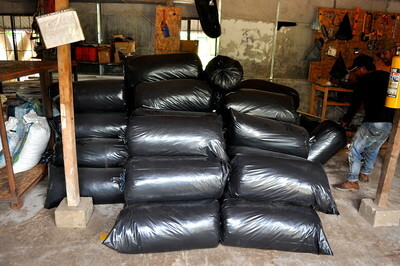 Once the bags are filled and compressed, they are sealed tight with a cord and taken to the storage area. 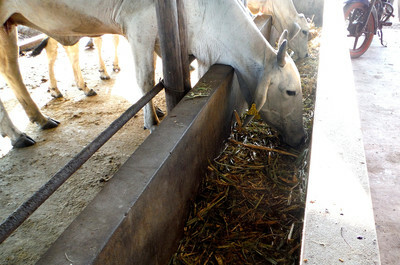 In tropical areas, it is best to store the silage in a shaded area, away from direct sunlight. The silage will be ready within 15 days of being bagged; it can last for up to one year, though we generally use it within four to six months. By being careful with the bags and keeping them out of the sunlight, we are often able to reuse them, which help to reduce costs. Silage produced on-farm is already very cost-efficient, as the main ingredient (the grass) can be grown on-site. Our cost of in-house production is approximately one third of the cost of purchasing competing commercial products. Here’s to happy Zebu cows pooping a lot, so that we can fertilize lots of trees! The process described in this article can also be used to make Bokashi, a type of Japanese fermented compost that is much richer in nutrients and quicker to produce than regular compost. Bokashi requires an extra step—preparing Bokashi bran—which is then mixed in with chopped plant material, manure, kitchen scraps and molasses. From that point the process proceeds as described in this article. The end result can be used as a soil amendment and fertilizer. Bokashi is not an animal feed. Recipes for making Bokashi bran (using wheat bran, rice water, sawdust or other ingredients) can be found on the internet.